HomeAllHilarious Whatsapp Conversation Between A Mother And Her Son On Her Birthday. 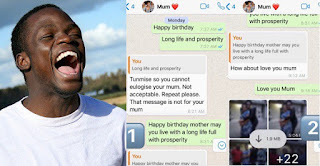 A Twitter user, has shared screenshots of the humourous conversation between her mother and her brother which took place on her mother’s birthday. The mother certainly has to be an English teacher with the way she was correcting her son – the gentleman had simply wished his mom a happy birthday and said a little prayer, but his mom wasn’t having this simplicity. His mom straight up told him to eulogize her like his sisters had done and in a bid to do this, he had a few errors in his eulogy. It’s her birthday, so she has all the time in the world, she pointed certain errors and asked that he corrected each one. Still unsatisfied, she eventually had to construct the eulogy for him and even at the end of the their conversation thread, she still corrected him.